Why is it that one of the hardest jobs of the gardening year is also one of the first? I’m talking about digging. Having spent the past few months lifting nothing much heavier than the 25th anniversary edition of Gardeners’ World Magazine, last weekend and today I have been busy confronting the veg plot in the knowledge that, if I want to sow carrots and potatoes, then I need a lovely fertile looking soil and not the rather drab wintry clods of earth that were staring back at me. So it was out with fork, hoe and rake in an attempt to create a fine tilth. It never fails to amaze me how many stones I churn up during this process. When we dug these beds originally, we removed a very large number of stones but, year after year, more appear! With carrots in mind, stones are a nuisance or a source of amusement, depending on your point of view. Stones are often the reason for the hilarious shaped veg that appear which may or may not be much use when it comes to cooking. Being Good Friday, it was also important to get our potaotes planted. Family tradition (well no one else I’ve spoken to has ever heard of this! ), possibly started by my grandfather, is that you plant your potatoes on Good Friday “when the devil is looking elsewhere”. This is supposed guarantee a good crop. So having dug, hoed and raked, we collected the beautifully purple chitted Arran Pilot tubers from the shed and popped them into the soil. Of course there’s not much to show for our efforts at this stage other than our rather strange arrangement of sticks. These are cat defences. There’s nothing like a lovely bit of soil preparation for our cats to presume that we are just improving their toilet facilities! Categories: Blog post | Tags: Carrots, Potatoes, Soil, Veg plot | Permalink. It’s hard to put my finger on it but there’s always a point in early February that seems to switch on my gardening brain. Whilst I will be the first to put my hand up in shame and admit to being a bit of a fair weather gardener, it’s not just that the short dark days of December and January offer little encouragement to go outside, there’s something inexplicable that triggers in February that says come on, it’s time to start planning, buying, putting ideas into action. This year it hit me yesterday morning. I opened up the February edition of Gardeners’ World Magazine and saw trigger words such as ‘sow’, ‘seed’ and ‘prune’, and before I knew it, I had a giant list for the garden centre today! Not that it was the most exciting list, principally consisting of large bags of stuff – compost (multi-purpose and ericaceous) and manure, plus tubs of poultry manure. However, there was also the promise of things to come with a bag full of seed potatoes (Arran Pilot) ready to chit and a sachet of Sungold tomato seed to be sown later this month. l discovered Sungold by chance some years’ ago before they became every chef’s favourite. Somehow they manage a unique depth of flavour that balances both sweetness and sharpness, making them the perfect tomato in my opinion. As soon as I was home it as out with the rose food and the manure to get our roses off to the best start for this year. Then it was on to pruning a giant overgrown shrub. This would have been a lot easier without the gale force winds which made the bush a constantly moving target! Meanwhile John could be seen attacking the buddleias at the far end of the garden, reducing their twenty foot high branches down to two foot high trunks. Now they are ready to go racing skywards once again. 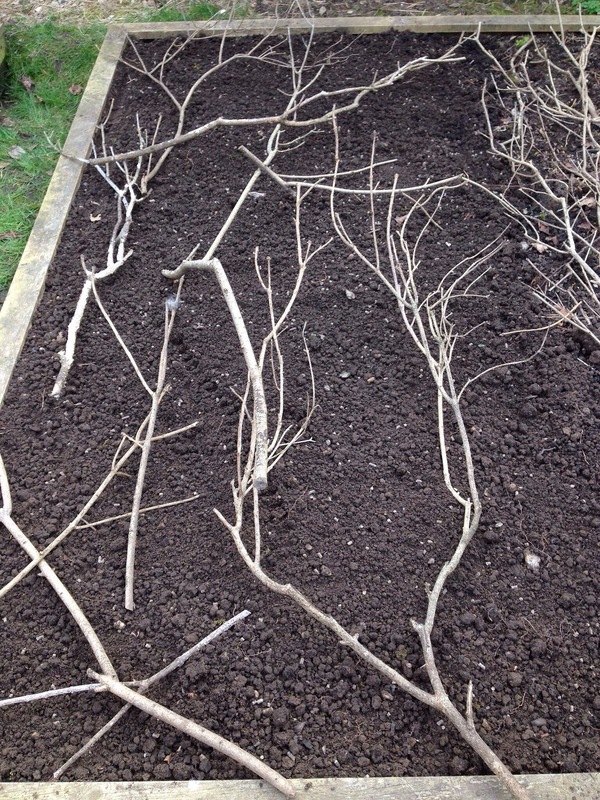 Categories: Blog post | Tags: Potatoes, Pruning, Spring, Tomatoes | Permalink.